A group of young future cultural leaders of Cambodia, led by Asian Cultural Council (ACC) Director General H.E. Suos Yara, visited the tallest Buddha statue situated atop the mountain hill of Fansipan, also known as the “roof of Indo-China”. 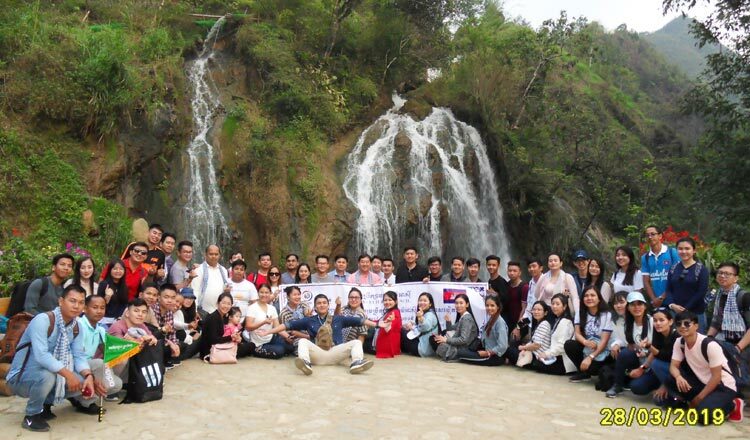 At least 67 of 80 volunteers from different backgrounds who have worked their sweat and blood for the success of the ACC Official Launching Ceremony were rewarded with an educational and unforgettable trip to Vietnam. These young cultural leaders were expected to observe and learn from their neighbouring country and apply the conservation and development models to their respective countries. The future cultural leaders of Cambodia traversed through the beautiful valley in its prime hour of the golden sunset; met and felt the lives of ethnic minorities, chiefly the H’Mong, the Dao and the Dai of Vietnam’s Sa Pa Town. They feasted their eyes on the terraced rice paddies lining the steep walls, and the magnificent views of mountain ranges and waterfalls. It was their first time to ride in the new German-innovative cable car as they crossed valleys and streams near the Chinese border, and felt the solemnity of the place 3,143 meters above sea level. “I am amazed to see how people can create this natural area to become a cultural, religious, and economic division of Vietnam. People in Sa Pa obviously respect the culture of their ancestors and take good care for the next generations. We can see and learn from the other countries’ culture and reflect back to Cambodia. Cambodian youth should take care of what they have now, especially our brilliant culture, to let the world know and recognise it,” said Chhap Nika, a young female volunteer currently pursuing English literature. 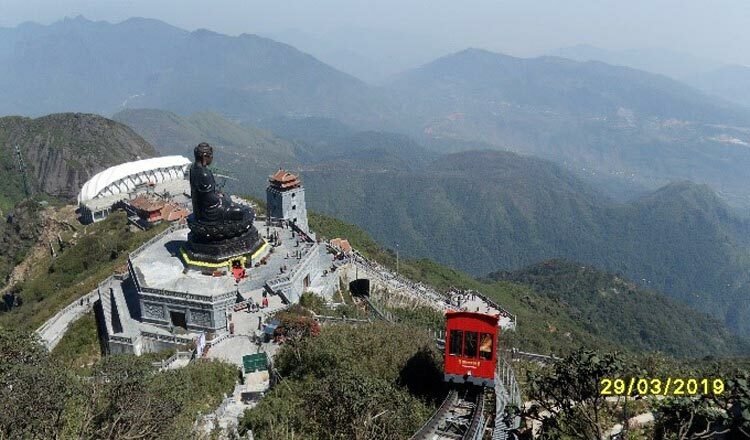 Nestled in the mountains among the clouds stood the Great Amitābha Buddha, the tallest statue in Indochina. The statue symbolises Sa Pa’s culture, peace, and long-term development, thanks to the heroism of Vietnamese people who fought for their independence and territorial integrity. Many of the participants were truly amazed at the geography, the lives of local people, and the innovation and technology that Vietnam applied to the conservative town of Sa Pa.
“I am impressed with the way Vietnam is applying innovation and creativity to Sa Pa combined with its culture, religion, and geography to attract the eyes of the world,” said Uy Sam Phallarith, head of youth volunteer recruitment for ACC, adding that Cambodia and the rest of Asia could and should have cultural exchanges with the storied nation of Vietnam. In Buddhist culture, Buddha relics are considered treasures. Buddha statues are always treated with extraordinary respect. In front of the sacred relics, ACC volunteers worshiped and prayed for the happiness of their families, prosperity for the Kingdom, and the harmony in Indochina and the world at large. “I pray for Cambodia to be blessed with peace and sustainable development. I truly believe Buddhism, as a philosophy, has united people from all backgrounds to communicate and love each other,” Dr. Kimlong Chheng, Asian Vision Institute’s Director of Center for Governance Innovation and Democracy, shared. “Buddhist democracy is the backbone of a harmonious and prosperous society, and we come to Sa Pa to witness this long tradition of peaceful coexistence between people and nature and between nature and development. Home to ethnic minorities and scenic views, the French envisioned Sa Pa as a quick escape destination from Hanoi’s oppressive summer heat. Today, it has become one of the main tourist attractions in Asia. Deputy Director of the National Assembly’s International Relations Department H.E Hok Bunly said Sa Pa was a great destination for volunteers to reflect the four inter-connected pillars of ACC, including culture for peace, sustainable development, human connectivity, and innovation. “ACC endeavours to promote human connectivity and innovation for conservation and development, just as Sa Pa gather all tourists from different background and utilise technology to enhance human values and human connectivity,” Bun Ly, head of the trip, said in a reflection session. The group also paid a visit to the memorial site of Ho Chi Minh, the greatest revolutionist in Indochina. In front of Ho Chi Minh Mausoleum, Mr Dom said he was hurt as if he was cut by a Valyrian steel; yet it is the greatest lesson all the Khmer people must learn from to avoid repeating the same mistake. The cultural trip to Vietnam was just one of ACC’s immersive programmes that uphold the spirit of international cooperation based on the principles of mutual respect, understanding and interest. It was established in 2018 by the International Conference of Asia Political Parties (ICAPP) and has representation from more than 350 political parties from 52 countries across the region. The Council is recognised by UNESCO after the tripartite agreement – between UNESCO, ICAPP, and ACC—was signed on December 4, 2018 in Siem Reap. ACC devotes its efforts and resources to promote cultural exchanges; build interfaith harmony in Asia; and transform cultural assets into international instruments of peace and cooperation and sustainable development.